Better Buy Now: Home Depot, Inc. or Lowe’s Companies? Which home improvement retailer stock reigns supreme? The home improvement industry is a good place to be doing business right now. A slow but steady rebound in the housing market just pushed Americans' spending on their homes to its highest pace since the beginning of the 2008 recession. Residential investments hit a quarterly low of $365 billion at the bottom of the housing crisis in 2010 — but were up to $585 billion this past spring. Source: Bureau of Economic Analysis via FRED. That industry tailwind is lifting the nation's two biggest home improvement retailers. Home Depot (NYSE:HD) just logged a 7% spike in comparable-store sales and Lowe's (NYSE:LOW) posted its own hefty 5.3% first-quarter gain. Revenue, profit margin, and sales growth are based on the last complete fiscal year. ROIC and P/E ratio are for the past 12 months. Source: Company financial filings. Home Depot looks like the obvious winner on these metrics. Not only is its business growing faster, but it also sports a higher dividend yield along with a much more efficient operation: Home Depot's return on invested capital is almost twice that of Lowe's. And shareholders can purchase all that operating and financial strength for 23 times the past year's earnings, or a slight discount to Lowe's 25 times earnings valuation. Even the one number that looks like a toss-up actually tilts in Home Depot's favor. 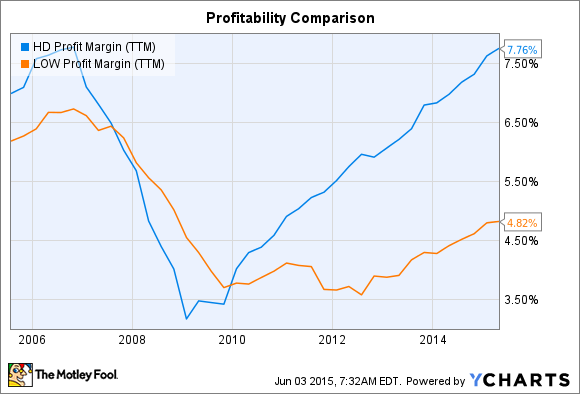 While Lowe's earns the same 35% gross profit margin as its larger rival, net profits tell a much different story. Home Depot enjoys 8% net profitability, compared to Lowe's 5%. And the housing market recovery has super-charged Home Depot's earnings recovery while Lowe's hasn't improved by nearly as much. So why are investors paying more for Lowe's right now? Growth outlook likely isn't the reason. In fact, both companies in late May announced updated 2015 forecasts that called for similar 5% comps growth. It isn't capital returns that make Lowe's a preferable stock to own, either. Lowe's just boosted its dividend by 22% and is spending $1 billion per quarter on share buybacks. But Home Depot is returning cash via buybacks at a quicker pace, and its dividend payments are much higher: $800 million per quarter compared to Lowe's $230 million. Lowe's does have a more aggressive expansion plan, which could be reason for extra optimism about its stock. Management expects to open as many as 20 new stores while Home Depot plans to leave its store count flat in the U.S. while adding modestly to its international businesses in Mexico and Canada. But in my view a bigger expansion opportunity isn't enough to make Lowe's the better buy here. Keep in mind that I'm a Home Depot shareholder, so I might be biased. Still, the stock looks like a bargain compared to its smaller rival whether you're judging by business outlook, financial efficiency, capital returns, or profitability. That's why I believe that five years from now, Home Depot's stock will have outperformed Lowe's by a healthy margin.